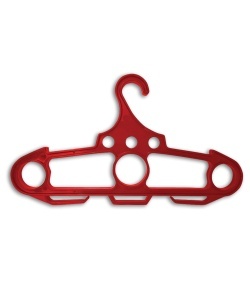 This Jericho hanger comes in a red color. The Ontario Knife Company Jericho tactical hanger is designed to support your tactical gear securely in any standard closet. Tough injection molded plastic is capable of holding up to 250 lbs of gear. Available in an assortment of colors for additional organization of your essentials.